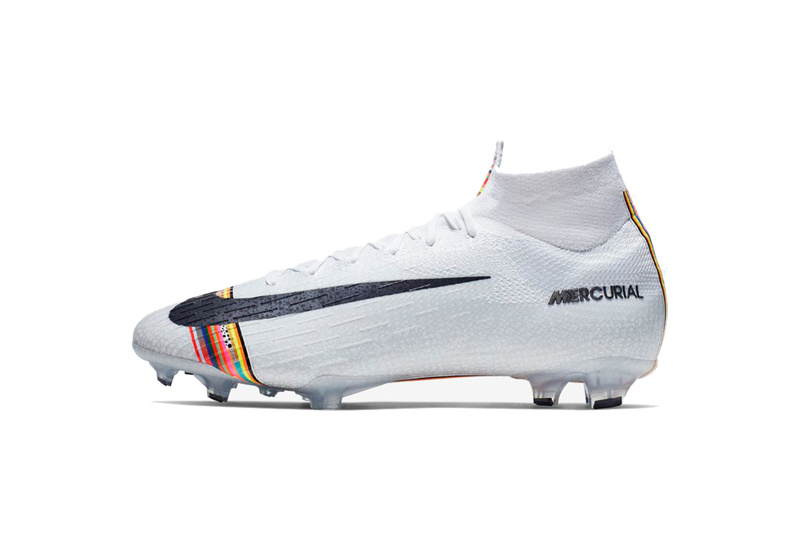 Nike celebrates the boldest hues from the past and present from its iconic Mercurial football boot line, adorning the Mercurial 360 Superfly with a “LVL UP” theme. The white upper receives a subtle all-over safari print and a classic bold black swoosh complete ALL CONDITIONS CONTROL stamp, nodding to the boot’s famed abilities. The print, which takes cues from the Nike Safari of 1987 and a Mercurial boot from 2010, provides a subtle base to the boot’s standout graphic. A combination of safari, silverware, cheetah, galaxy, gold and lava-inspired patterns are blended with neon hues of yellow, pink and orange, metallics and volt to provide a toe box band, which is carried to the top of the tongue for another small highlight. The patten also flows underneath the boot, adding a pop of color to the “Clear/Black” cleats, and wraps up to the heel of the shoe. Finished with black Mercurial branding, the 360 Superfly “LVL UP” will be available on March 31 from Nike and select stockists. For off the pitch kicks, take a look at these Nike Zoom Fly Flyknit’s in its latest gradient design.